God’s mercy can make even the driest land become a garden, can restore life to dry bones (cf. Ez 37:1-14). … Let us be renewed by God’s mercy, let us be loved by Jesus, let us enable the power of his love to transform our lives too; and let us become agents of this mercy, channels through which God can water the earth, protect all creation and make justice and peace flourish. 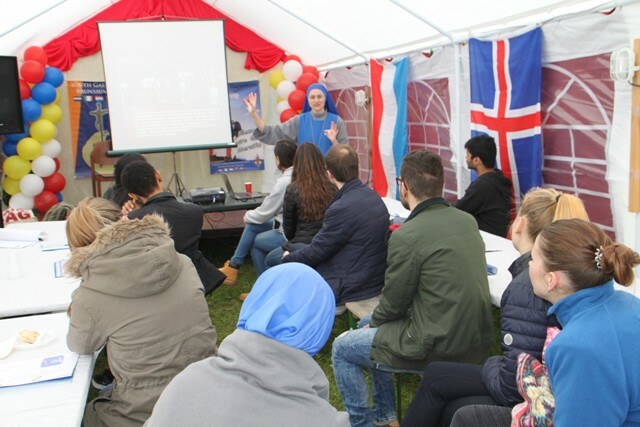 We left Iceland early in the morning on Thursday, May 12th with our group of youth and arrived in Luxembourg for the III Annual Youth Gathering in the Northern European Province SSVM. The sisters live in huge monastery, with a large backyard lined with a high stone wall. The surrounding area is Luxembourg City, filled with apartments, and busy streets bursting people on the go – lots of cars, buses, and bikes. There is a lot of movement everywhere. The cloister walls make a little space in the city for the contemplative and active communities of our sisters and during this particular weekend it was a little space where youth came from all over Europe to be renewed by God´s mercy. 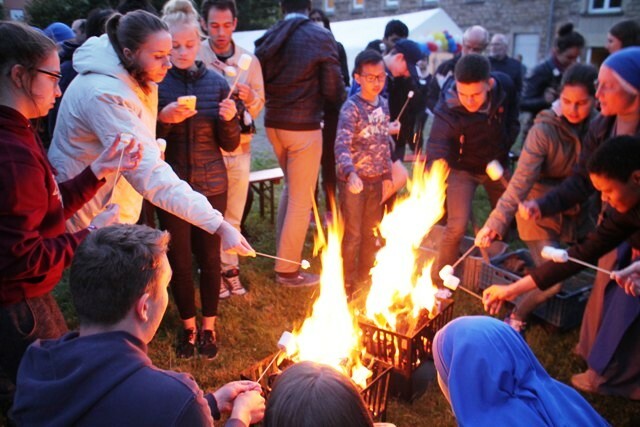 On Friday evening, youth poured in from Lithuania, Holland, Luxembourg, Belgium, and from many other nationalities and culture heritages within these countries – Polish, Filipino, French, Spanish and more – a very international experience. Our youth from Iceland had surely never seen so many young Catholics before. 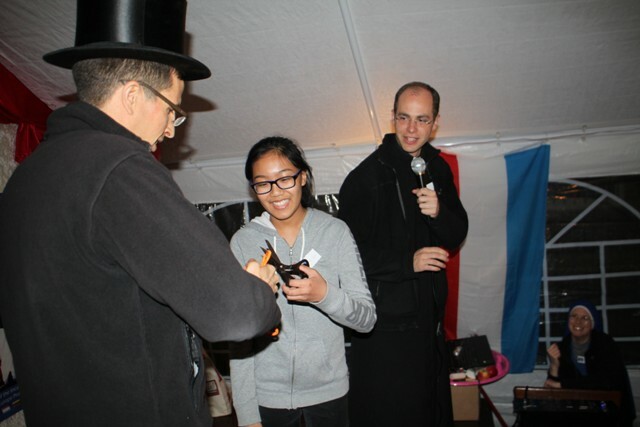 Not only were there so many young Catholics, but they came to pray and participate in all the activities with a great spirit. The weekend began with Evening Prayer and Father gave “Good Nights” about how God is calling each one of us to great things – to the adventure of holiness. Recreation time began after Evening Prayer and the fathers and sisters had prepared so many skits and games that the evening was filled with laughter. I´m sure that the people in the surrounding apartments could not help but notice the joy in the air. By God´s great mercy, in the middle of Luxembourg City, the heart of Europe, in the midst of a culture which has in many ways forgotten or rejected God, there was a small group of chosen ones who spent this weekend seeking the “one thing necessary”. 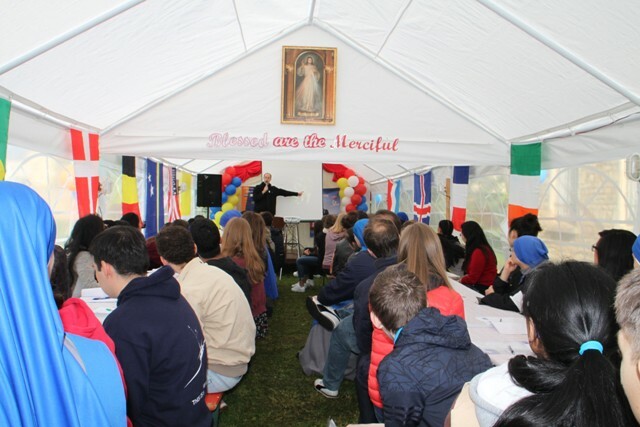 Saturday was marked by a plenary talk about God´s mercy, in which Father encouraged the youth to first receive God´s mercy and then to thank Him for this great gift by in turn being merciful with others. He asked us to speak in our small discussion groups about concrete ways be more merciful in our daily lives. In our small groups, there were some real plans made to bring God´s mercy back to Iceland, to the schools and in their classes. 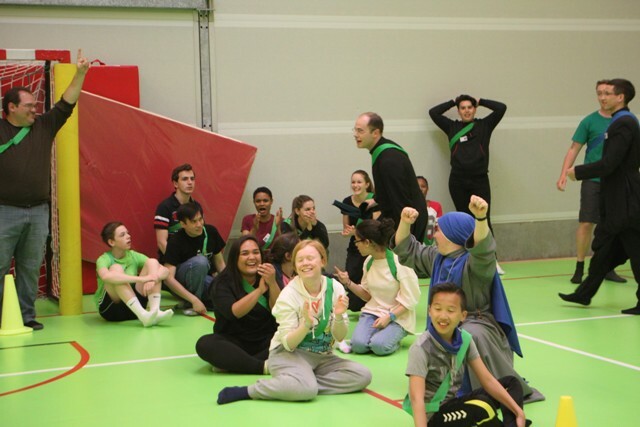 In the afternoon we brought the youth to a sports complex where an atmosphere of competition and anticipation reigned as the teams gave it their all to win the most points and have the most fun! There were many workshops throughout the day touching some of the most relevant topics surrounding the youth of this generation: gender, social media, chastity and marriage, just to name a few. 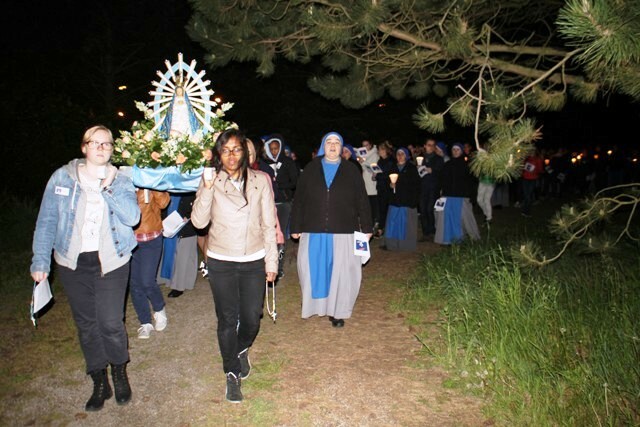 On Saturday evening we had the Rosary Procession, adoration, Evening Prayer, Confessions and the bonfire. We roasted marshmallows, sang songs, danced and made a lot of noise. Again, I imagine the people who could see us from their apartments asking themselves, “What are they doing? Why are they singing? Why are they so happy?” The answer is so simple: God. These youth came to encounter God and His Mercy. Is there a greater reason for rejoicing? The weekend ended on Pentecost Sunday with the Holy Mass celebrated by Bishop Hollerich who spoke of the Holy Spirit´s role in the Church and in the lives of the youth, giving them the strength to be witnesses of God in today´s world. On the Friday before the Youth Festival and the Monday afterwards, we traveled around in Luxembourg and Germany. Friday morning, we took the youth on pilgrimage to Trier, where we were able to spend time in the Cathedral and pray in front of the Seamless Robe of Christ. We also went to some of the churches in Luxembourg, taking advantage to pass through the Holy Door and pray in front of Our Lady Comfort of the Afflicted and other beautiful, antique images and statues. 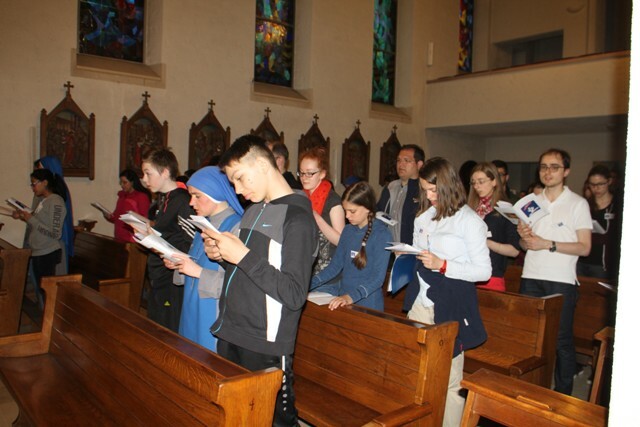 As the majority of the group was being prepared for the sacrament of Confirmation, we took advantage at all the holy places to pray for all the graces necessary for a good preparation. I think this trip was really important for the youth on many levels, but especially for them to get to spend so much time with the priests, sisters and so many youth with a living faith. Also, they were able to experience the history and beauty of the churches in Europe, see the relics, light candles and pray for an intention. These children live in remote towns in Iceland and some only have an opportunity to attend Mass twice a month, not in a Catholic Church but in a public building. This weekend was short, but gave them an opportunity to experience the faith in a real and living way. On the way back to Iceland, the youth made plans for coming back next year, asking for all the details: where it will be, what dates, who will come back etc. Their enthusiasm was contagious. They sang over and over the refrain from our theme song “Blessed are the Merciful” and a few times – in public – they sang the verses and did the motions that go along with the works of mercy. As the plane was landing in Iceland, I heard their voices singing the last line of one of our Icelandic hymns that ends with “Ave, ave, ave Maria”. It´s impossible to know all the graces that God gave to all the youth at our Youth Festival, but certainly God touched their souls, and maybe through them will touch more. If each young person goes back home and puts into practice that work of mercy that Father encouraged them to do in his plenary talk, the world will become a little bit more merciful. Adoration, Confession, Iceland, IVE, mercy, pilgrimage, SSVM, youth, Youth Gatehring.